New chapter additions on fish and birds. 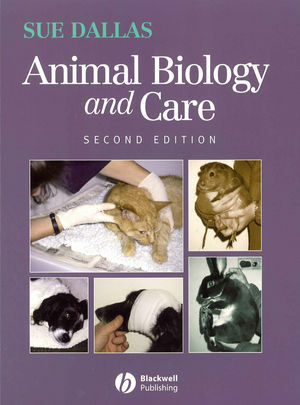 Clearly and simply laid out, with over 150 illustrations, Animal Biology and Care 2e will be invaluable to all those training or working in animal care. Sue Dallas is a qualified veterinary nurse, and she has worked as a member of a nursing team in both veterinary school, veterinary practices in the UK and in North America. She has been teaching on both veterinary nursing and animal care courses for over 20 years. During that time she was involved in a number of educational and examination developments for both sectors. Over the years she has spoken at all the veterinary congresses in the UK and around the world. She has promoted nursing and care of animals through training and education. In the early 1990’s she became involved in publishing as the editor of the Veterinary Nursing Journal (VNJ), the official journal of the British Veterinary Nursing Association followed by publication of text books for both veterinary nurses, auxiliaries and animal care. 1 Cells and Basic Tissue. 2 Movement of materials within the body. 3 Body systems and functions. 5 Body as a whole. Section 2 Animal Health and Husbandry. 8 Disease transmission and control. 10 Diseases of the dog and cat. 16 Grooming and coat care. 17 Pets: mammals, birds and fish. 18 First aid and nursing. 22 Monitoring temperature, pulse and respiration. 23 Pharmacy and the administration of drugs. Appendix – Anatomy and Physiology Terminology. The text has been be revised and three new chapters added on reptiles, fish and birds.